Another glorious day, Jo taking some photos from the engine 'ole. Now moored near Charity Dock, Bedworth, on the Coventry Canal. Another excellent day started with all but the last of the Stockton locks set for us, which we did in 90 minutes. Jo had her 1st taste of locking up through wide locks. Nelson Wharf is coming along quite nicely. At Calcutt locks we met up with Chris on Peggy, the Willow Wren training boat out of Nelson Wharf, training some crew from the Avon Navigation Trust. Passing Trevor Maggs on Corona between Braunston & Napton heading to Banbury. Now moored up above Hillmorton locks. Set off from Saltisford Arm this morning at 9:30am, and sold some coal above Cape locks. We had the company of nb Jameson (Irish Whiskey) from Cape top lock through to Bascote top lock which was much appreciated, especially with such pleasant company. Now moored just before Bickley's Bridge No.26 Long Itchington. Been enjoying the warm sunshine today. 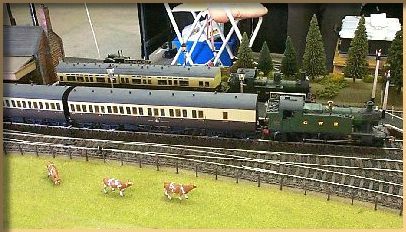 These are some of the model buildings I will include on the layout. This pair of cottages and the Post Office below can be combined as a terrace, which is what I will do, with the Post Office nearest the road junction. This is the “Black Horse Inn” which will suit being near the canalside rather nicely. This will be the lock cottage. This is the station booking office. This is the farmhouse and barn. This thatched cottage will go somewhere on the layout hopefully. No canal scene would complete without a pillbox. I have already purchased and stored away the cottages, Post Office, pub, lock keepers cottage, barn and pillbox, and look forward to constructing them in the future. By buying them now I have probably saved money as no doubt by the time I start building the layout the prices will have gone up, but also they may well be taken out of production, which would no doubt be my luck. As Jo and I have decided to run down our coal business, due my back and Jo’s Hernia we have found it a struggle to handle the bags of coal out of the hold, Jo suggested that that once we have sold and used the remaining coal that I should build a model railway in the hold. I am hardly likely to say no, and have been planning the layout. It will be a while before I can start, as we have to sell and use ourselves all the coal in the hold, which is about 4tonnes, but it doesn’t start there. Once the hold is empty we will have to lift the floor and clear out all the coal dust, paint the inside of the hold under the floor, install engineering bricks as ballast and then build an insulated room underneath the sheeting. The sheeting being plastic sweats a lot and I can’t have water dripping on the layout, plus it gets very cold out there in the winter, which is probably when I will spend most of my time out there. However, in the meantime I have been making models of what I hope will be the layout, using balsa wood. Creating models means I have an approximate idea of what it will look like, although some variation may be necessary once I start building it. This is version 1 of the main layout which will be 12ft by 2ft. The track is a basic figure-of-eight, and includes a canal terminus, which will have the model of Hadar that I have as centrepiece. It will extend across the hold to a 12ft by 1ft fiddleyard. However, before completing this model I decided that the terminus of the canal, which had to be capable of allowing narrowboats to wind was taking up too much space and would be unworkable, so this version was abandoned at an early stage. This version now had a canal running through the layout and included a lock, which took the canal below the level of the baseboard, which is feasible in modelling standards, but I was still not satisfied with the result. This again was abandoned at an even earlier stage. This version I did complete, as can be seen from all of it being painted. The grey is the railway track, the brown is undefined areas which could be earth or some alternative surface, the black is a road, the blue is the canal and the red is brickwork and bridges. This version had more possibility than version 2 and I was more pleased with the final result. However I had other concerns which would bring about version 4. The first was that the incline of the rail track to have the high level section was technically running the wrong way, and due to the rise of the boat from stern to bow would result in the level part of the layout being physically inclined, and the incline being double! Not a good idea. I was also concerned with the limited access past the stand and mast, in between each would be the layout. Further thought about this brought about version 4. This is the original paper drawing. On this I have shown the full layout including the fiddleyard and the crossings across the hold. It also shows the positions of both the stand and mast within the hold. The left hand end also shows the doors into the hold from the saloon, and by taking the layout through to these doors it has given wider access through the lift up section now across in front of the doors, in combination of reducing the width of the fiddleyard section alongside the stand. At the other end of the layout by placing the lift up section diagonally across from the mast to the fiddleyard this has also given wider access through to the front of the hold. The main layout does extend to the bulkhead between the hold and the saloon, alongside one of the hold doors, which now makes the main layout now 16ft long, an extra 4ft. As with all the previous versions this paper drawing was used to build the balsa wood onto. This is the full model of what hopefully will be the final version. This version is a mirror image of the previous version from left to right, which now means that the level section is sloping whilst the incline will be more level. The canal now includes 2 locks which raises the canal over the railway track, easier to build than taking it below the baseboard. The colours are the same as the previous version with the addition of silver for the lift up sections. I am so happy with this version I have added some of the proposed buildings and wooded areas. This will be a farm and wooded area. This area of the layout has a lock cottage alongside the top lock with a row of terrace cottages opposite across the road, and a pub on the other side of the road junction. This is the station building on the platform. We had our Heritage Weekend event this weekend, which Jacky and Jo have been planning for a while now. Saturday was a shame, the drizzle kept most visitors away, but Sunday was much better and we had lots of visitors enjoying our event. Mike the Chairman of the Trust visiting our stand where I had my rag-rugs and Jo had her crochetwork, her new cards made from her photos and various bits and bobs for sale. The Samba band were a great success on both days, they thoroughly enjoyed themselves, especially the trip on our Day Boat Saltie II on which they carried on playing, drumming up people along the canal! They enjoyed themselves so much they want to return next year, which is great. Their leaving drums out for the kids to play was a great success, which according to them is very rare. The Model Boat Club had a great time as usual and it was great to see this model narrowboat out on the water. Nutfield & Raymond have also said they would like to return next year which is brilliant, they said they had a great time, and because it isn’t a boating event all our visitors were interested in the boats, which is nice to hear and we look forward to welcoming them again next year. Nutfield & Raymond arrived at Saltisford Arm today ready for our Heritage weekend this weekend. We are so pleased to have them here for our event, we hope they have a good time with us.